Back at Google I/O, the search giant announced the Samsung Galaxy S 4 with Nexus User Experience, a device which combined Samsung's SGS4 hardware and the stock Android experience atop it. Later on, HTC made an announcement of its own about an upcoming HTC device with the same exact promise – unadulterated HTC One hardware running unadulterated Android. 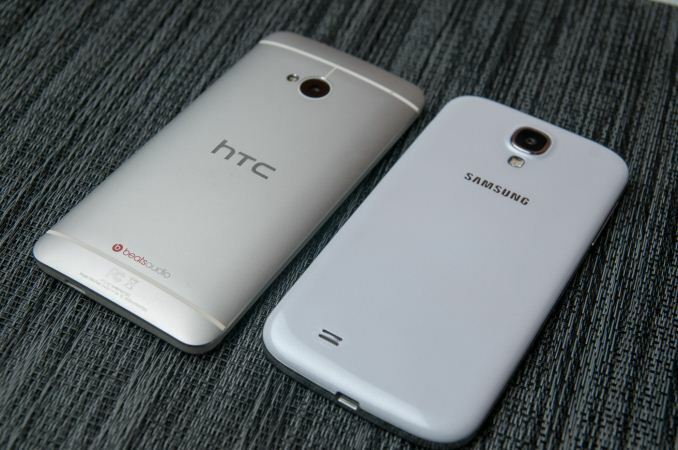 Both devices originally didn't have formal names, they're now the Samsung Galaxy S 4 Google Play edition and HTC One Google Play edition, respectively (henceforth SGS4 GPe or HTC One GPe). Google I/O went on to be a not so subtle breakdown of Google's strategy to de-couple more of the platform from the primary point releases of Android to get more consistent user experiences and APIs across the ecosystem. While many expected new hardware and a new version of Android, although both were teased, the real big news was primarily Google solidifying more of the experience consistency for developers and users alike. If you look at that theme from a higher level, you can see how Google also clearly wants to extend this to hardware through an ambitious new Google Play edition initiative which starts with the HTC One and Galaxy S 4 Google Play editions. The hardware is already a known entity – we've reviewed both the HTC One and the Snapdragon 600-based Galaxy S 4 – the question is how that experience works with stock Android. The obvious goal of both Google Play editions is simple – the Nexus phone isn't on a fast update cadence, so taking advantage of the flagship smartphone hardware from both HTC and Samsung is an easy way for Google to keep its offerings fresh. The promise is the combination of smartphone hardware that will remain the best of the best through Fall 2013 and the latest and greatest Android software release (4.2.2 right now and later on probably 4.3 like I've previously speculated) updated in a timely fashion. There's a precedent for Google doing some this under the umbrella of "Google Experience Devices" with the Motorola Xoom and TI PandaBoard. The new phrase at Google I/O was "Nexus User Experience," but interestingly enough the final one is "Google Play edition," distancing it a bit more from being canonical Nexus. It's clear that Google's Nexus strategy isn't going away, it is however clearly changing. We'll touch on the software update and who-builds-what side of things in the appropriate section. Anyhow the HTC One and SGS4 are both known entities, and the hardware here should be familiar to anyone who has read those reviews or any others. The fact that both are Google Play edition simply means they carry no operator branding. There's no AT&T logo etched into the back of the HTC One nor SGS4, no operator adulteration anywhere. 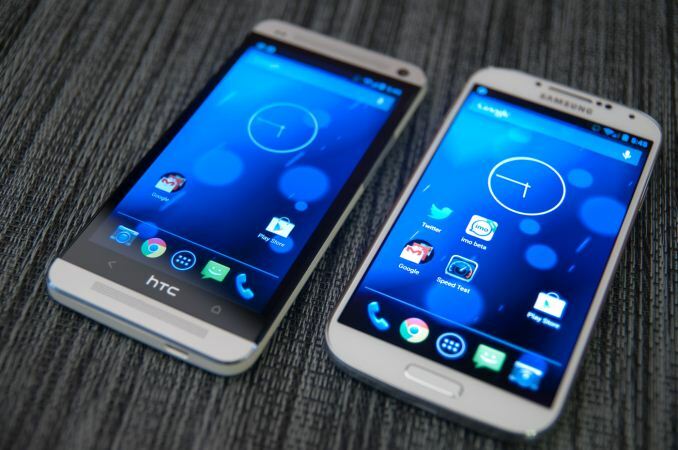 The GPe versions won't fundamentally change anyone's mind about whether the HTC One or SGS4 is the better hardware, since the intrinsic properties of both are unchanged. Likewise there's still a microSD card slot and removable battery on the SGS4, and the HTC One still has its phenomenal metal unibody construction and UltraPixel camera. What is and isn't enabled really comes down to software, but again more on that in the appropriate section. The pricing announcement for the SGS4 GPe drew audible booing from the crowd during Google I/O, something that struck me as odd and shocking for what should be a reasonably savvy audience. The reality is that there's no way Google, Samsung, or HTC would massively undercut flagship device pricing mid-cycle with prices either near cost or offset with an invisible subsidy. This isn't a Nexus 4, it's another OEM's hardware running software Google has dictated, and as a result the two phones come in at around typical unsubsidized pricing. That translates to $599 for the 32 GB HTC One and $649 for the 16 GB SGS4. Both are live on the Play Store (link below) as of this posting. The GPe versions are aimed at the US market and variants with the appropriate banding were selected for this purpose. Google didn't (and for timing reasons basically cannot) make Samsung or HTC craft new variants, thus existing ones were used. 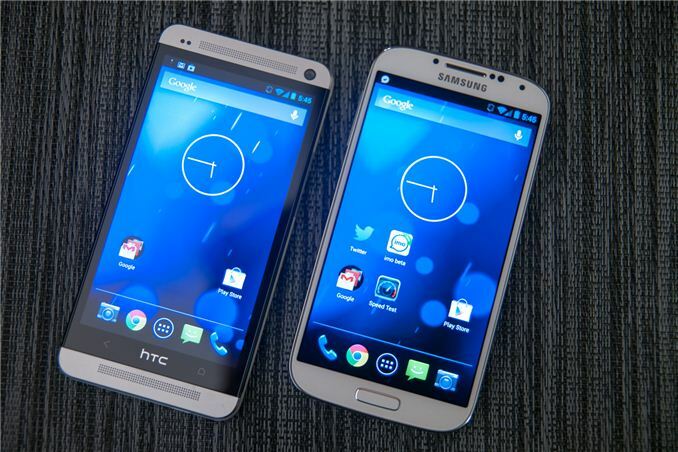 In the case of the HTC One GPe, that's the AT&T USA (M7#UL ATT), same as the factory unlocked and developer editions. In the case of the SGS4 GPe this translates to the T-Mobile USA variant (SGH-M919) which is the same as the AT&T (SGH-I337) variant but without the pointless and arbitrary operator-requested RAT locks that prevent Band 4 WCDMA from working. Likewise I find myself wishing that HTC would disable those locks which prevent Band 4 WCDMA from working on their developer edition, unlocked edition, and GPe, though that would require FCC involvement since it lacks certification. Anyhow the layman's translation is that the SGS4 GPe and HTC One GPe work out of the box on AT&T and T-Mobile LTE. The SGS4 GPe will work on all of T-Mobile and AT&T HSPA+, HTC One GPe will work on all of AT&T HSPA+ but only Band 2 (1900 MHz) T-Mobile HSPA+. The HTC One GPe will not work on T-Mobile's Band 4 HSPA+, only its Band 4 LTE. If you're on Sprint or Verizon CDMA/LTE and care about having Nexus phones you're again on the wrong side of the fence and probably will be for the foreseeable future. I tested both T-Mobile and AT&T personal SIMs in both devices, and had no issues with them attaching flawlessly to LTE and HSPA+ on the respective networks. Now that song's going to be stuck in my head.